1. The image should be placed using numbered polygons. 2. It’s very simple, match the right polygon to the marked place. 3. If you have a problem finding the right place, you can use the hint function. 4. Create amazing poly artworks and enjoy them. Poly Art Puzzle Coloring Book features lot of poly drawings, beautiful pictures that you can create. Colorful items, animals or flowers for girls and boys available in our poly art coloring book for kids and adults. – sweet faces of children👶 and hundreds of other beautiful artworks from polygons. What can you do with the Poly Art Number Coloring? 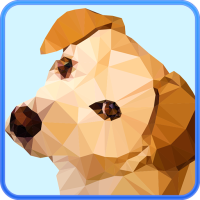 polygons to create animals, wild animals, flowers, or other colorful drawings and beautiful images available. Every created pictures look like 3D models. Our coloring book is a journey into the world of peace and relaxation. You can save your completed colorful drawings and set them on the screen of your phone. You can color beautiful paintings and show them to the world. Our coloring book is easy, relaxing, and fun to play every time when you feel bored. Are you looking for fun puzzle coloring pages? You have just found them. It does not matter, whether you are an adult or a kid. You will fall in love with our puzzle coloring book. Poly Art Number Coloring – Puzzle Coloring Book to anyone who remembers playing in the sandbox. Puzzle Coloring Book is a relaxing polygons coloring app for persons of every age. Poly Art Number Coloring – Puzzle Coloring Book is a fun, color matching game that anyone can play.